This is a guest post by student placement Vanessa. Manuscripts and Special Collections is a section of the University of Nottingham Libraries located on the University’s King’s Meadow Campus. The archive holds over 3 ½ million original and unique documents in over 700 manuscript and archives collections, dating from the 12th to the 21st century, and over 80.000 rare and old books in the Special Collections. One of the German language Special Collections held in this section of Libraries is the German School Books Collection. 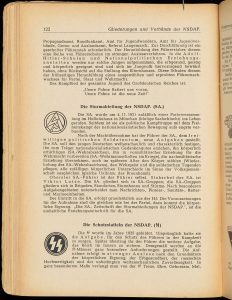 It consists of over a hundred school manuals published in Germany during the 1930s and 1940s. The books can be consulted at the Manuscripts and Special Collections Reading Room at King’s Meadow Campus. As an Erasmus exchange student from Berlin, I decided to write a dissertation during the academic year 2017/ 2018 at the University of Nottingham. The topic was chosen after an initial meeting with my supervisor Heike Bartel. I wanted to write about the indoctrination in school textbooks during the Third Reich and a lot of primary material could be found in the Special Collections at King’s Meadow Campus. I spent many hours in the Reading Room with original German textbooks from the years 1933 to 1945. The research was interesting, as I gained a much deeper insight into the topic than during my history classes in school or even during my undergraduate degree in Germany. The archive holds many different German textbooks from the Second World War era. There is so much material that my supervisor and I decided to organise a pop up exhibition for the University students. For this exhibition I chose eight books. I used five of these books for my dissertation, whilst the three other books were recommended by Nicola McLelland. Those three were written and published in United Kingdom for learners of German, one was published during the time of the Second World War, while the other two were published afterwards. This gave the students the opportunity to see how English speaking people regarded Germany at that time, but also how the German language was taught. The other five books covered a range of German history, geography and reading books. 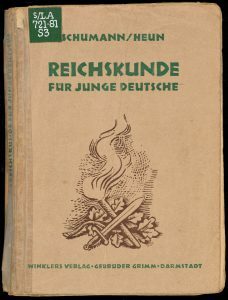 One book belonged to the subject Reichskunde, which the Third Reich established. This subject was about everything the students should know about the Reich, its ideology and its Führer. Pages from this book were digitised so that students could flip through a couple of pages, as the original text books were kept in glass cases to protect them from any damage on the exhibition day. As a visitor of the Reading Room you can touch the books and read through them yourself. The pop up exhibition took place on 10th May 2018 in the Trent Building on the University Park Campus. A member of staff from Manuscripts and Special Collections and I were there throughout the day. The visiting students could ask questions about the material and learn more about the topic, but also about the work in an archive and how to get access to the archive material. Even though the date was during the exam period, many students found the way to the hidden CLAS area in the Trent Building and had some spare time to engage with the topic. A reading book that was explicitly for girls also showed that there was a big difference in the education of boys and girls. Boys were raised as soldiers, who should not be afraid of having to die in combat, whilst girls learnt everything about becoming the perfect housewife and mother. Along with some easy and entertaining texts, the reading books for girls also contained some simple sketches to reproduce. I was amazed about all the positive feedback I got from the visitors, who showed a lot of interest in the displayed material and were eager to learn more about the indoctrination of pupils during the Third Reich. The research for the dissertation and the organisation of the exhibition were great opportunities to get to know more about Germany’s politics and history, but also about the work in an archive. I am grateful for the opportunity and want to say thank you to the very helpful staff at Manuscripts and Special Collections and to my supervisor Heike Bartel. 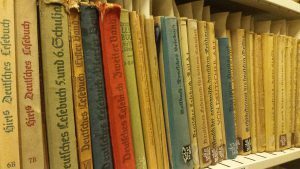 If you’re interested in the German School Books Collection, then you might also be the Third Reich Collection and Papers of Dr Bernard (1888-1959) and Mrs Irene Steinitz, all of which are are available to view in the Reading Room. Please contact us to make an appointment.